Knitter friends, do you experience a pre-spring slump? I have noticed this about my knitting activity in the last few years – I knit feverishly from November to February and then by the time March hits it’s like the enthusiasm has dulled to a hum. I’m still knitting, still have projects I want to finish, but it’s a bit in slow motion. I am not sure why this happens, but it is always reassuring to me to remind myself that it does seem to happen to me every pre-spring, and that the regular order of things will return again eventually. I think part of the reason is that it’s around this point in the season when it’s still cold enough to be wearing knitted things, but there’s not enough winter left in the calendar to guaranteed that the things currently on the needles will be wearable in current season. So I really want to wear the things I’m knitting, but am impatient about the whole having to actually knit them part. Inevitably, I respond to this feeling by casting on more projects. This doesn’t help with the getting-something-finished part, but I never said any of this process was rational, so there you go. To wit, I am currently knitting 2 sweaters (the Reverse Me cardigan that I started a month ago – in the photo above now on the beginning of one of the cable panels for the collar), the Bray cardigan (from a recent Interweave knits), another Pi shawl (below, started earlier in the winter and now revived for portable knitting), a hat (for a gift, not shown here), and another hat that I started 2 months ago and should have finished basically instantaneously but instead it’s still sitting in its project bag. Except for one of the hats, I’m knitting all of these projects with already-stashed yarn, which is pretty great from a frugality standpoint and for the satisfaction of having yarns ready and waiting for whatever whim I feel like. And they are all fabulous yarns, working up lovely patterns. But man it’s a bummer when you’re not loving your knitting as much as you think you should. Rationally, at this point, I know the best approach would be to just pick one project and knit away at it until it’s done, and then do that again. I could pick off the hats one by one and then come at one of the sweaters full on. Whether or not I will do that, on the other hand…Well we’ll see where we’re at next week. Next time I hope to be reporting more progress on the finished items front. I hope you’re enjoying your knitting this week, blog friends! And that you have a lovely weekend ahead to spend time with your crafting work. Happy Friday! I am in that same place. I knit full in on a pair of gift socks and knitting on another pair of gift socks. 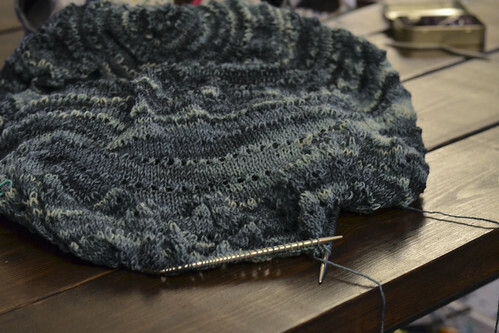 The bulky yarn cardigan that is on the needles should be further along than it is, but the mojo is not there. Snow is in the forecast this weekend, maybe that will spur me in! I wondered what was wrong with me! LOL Got the same problem here, but I’m not casting anything on. Just have it sitting on the needles waiting for inspiration. In one case I need more yarn and until they get it back in stock I’m a bit stuck. Might pick up my crochet this next week. I need to restock my baby blanket supply! I feel that way about everything in March. No enthusiasm about anything. Happens every year, and always passes. I thought it might get better once I retired, since March is the longest month for a teacher, but no. So I just go with it and accept that I will be a March slug. Glenna, please be kind to yourself. Open your blog page and look at the number of times you were reporting on finished projects. Women have an innate blindness to what has been accomplished and tunnel vision for what is yet to be done. Just ask yourself how many times you hear a man say “There is so much I just haven’t finished.” Hardly any! Encouragement to all you knitting friends! OMG, 379Christy, your comments are ‘right on’! actually doing any knitting lately. Really like what’s going on in that Bray cardigan, Glenna. I don’t seem to have that problem, at least not this year. I think spinning has helped with it – I work on one or the other each night, and of course, the socks travel with me everywhere, so come along in their own time. So I get a change. 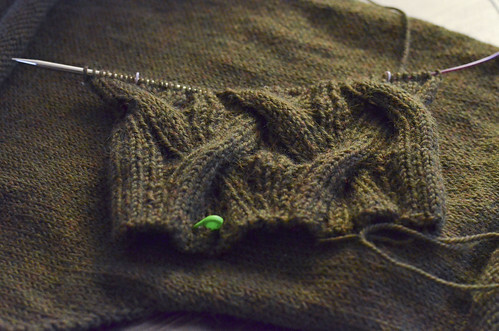 I do have a cardigan on the needles that I think I can wear this season if I keep on going. We have a lot of spring sweater weather here. And I will be glad to open the drawer and find it there next fall. 🙂 I tend to slow down in the summer and knit light weight things like lace shawls. No wooly sweaters for me in hot July! Nice post Glenna and it happens to the best of us from time to time. I knit every day, even if it is just one row of a 350 stitch blanket, I know it will get done eventually but I don’t set a dead line for myself. The cycle that you mention, (work hard, then rest) is built in us all, from the begging of time. We hunted when the herds were around, we planted in the spring and reaped in the late summer and early fall. We gathered the berries and nuts in their season. There were always schedules of when we did things and one of the schedules was in the winter when we could not hunt, farm or gather, Then we sat around the fire and repaired our clothes, made new items and created our ornaments. You are just following what your ancestors, ancestors did. No need to worry about it and as Christy said “there is always tomorrow”. Christy also said that men hardly ever say “There is so much I just haven’t finished.”, we say “I don’t give a damn” like Rhett Butler said. We just plod along and get things done whenever… of course we don’t have the responsibility of getting the kids off to school, fixing lunches, shopping for food, preparing dinner, making sure the house runs smoothly..,Oh My. All that was written for the Christy’s of the world. I raised three boys alone for most of their young lives and I did all that plus worked two jobs at times and still had time to knit… I just didn’t have time to blog about it. Now that they are all grown or have died, I have the extra time to knit (one row at a time), to blog and to work on the genealogy of one thousand families. All gets done at it’s own schedule but of course my knitting is not as beautiful and complicated as yours Glenna; mine is just functional; blankets, hats, gloves, purses and pouches to hold items… hmm… almost looks like the list of items our first ancestors had to do, all I lack is family around the fire… although the 52″ screen TV does put out some heat, light and brings me stories while I knit my one row of my future blanket. Did you read my mind? Were you a fly on my wall? You summed up me and my plight perfectly! I have that pre spring slump too, I think I’ve worn myself out from Christmas and new year projects!! You are right, we all know how to finish them but get phases when something just stops us! I love starting new projects too as I get impatient when a project takes too long so want that feeling of starting something new. This then impacts the backlog problem and results in motivation slowing! Hope you complete your projects. They look lovely and stitches are beautiful. When the sun comes back, all we want to do is go outside. Sun means heat. Heat means, no wool. No wool means less knitting cause wool is too hot. Gardens call. Summer fun calls. Spring is in the air and other activities beacon. As for me, I have a baby blanket to finish so, sun or no sun, knitting needs done. For me, it’s not a slump. Rather it’s being pulled in different directions. Do I go outside and spend time in the yard as the temperatures begin to rise and the snow melts? Or do I keep knitting to finish my latest project? Just so happens that was what yesterdays blog post was about. I wrote a post about a similar feeling/occurrence in February. I do find myself in the same position here in Australia with the reversed seasons. I cleaned up my yarn and all finding so many projects not finished. So far I have 2 projects that I have crocheted myself to pause on those until I can go shopping again. Need to add one more comment after reading mionsiog’s comment. The “Christy’s of the world” are NOT all married women raising families as it may have been assumed. who also still knit and want to finish what they’ve started. The “Christy comment” was simply reassurance that women (and all of us) shouldn’t beat ourselves up for not finishing because, well, we all do what we can … in the time that we have. The knitting can be viewed as a “resting place” while also serving us as a “creative space” or “productive time” – for things practical, or challenging, or visionary … or, to fill time when we’re lonely – as we all are from time to time. The “Christy’s of the world” are there with us to give encouragement and help to all of us – male or female, single parents, those who are sad or have suffered by loss, prejudice, unkindness. Glenna keeps reminding us if we want results we need to ‘keep on knitting’ to produce something – whatever that vision of “something” is to each of us. OMG Yes! I’ve been hardly knitting at all. I think I did 2 rows on a shawl last night. 2! Granted, I think each row is about 400 stitches, but still. I’ve been spending a lot of time doing Sudoku puzzles instead, which is not very productive. By the way- I LOVE those cables in that first picture! While I absolutely know that feeling well, I am (*frantically touching wood*) not yet experiencing it this spring. Possibly because I’ve been lucky enough to be at a yarn festival recently and that has definitely kept my knitting mojo going. Your current knitting is beautiful, even though you’re not feeling very inspired right now! I definitely hit a slump, but for me, it is in January & February. I produce huge volumes of Christmas ornaments and do the whole run of Christmas craft shows, so by January I don’t even want to look at knitting needles & yarn :(. Now that we are into March, my creative bug has bitten again! I hear you. I picked up my knitting yesterday for the first time since February. Im a teacher snd the kids are climbing the walls with no breaks si my time is spent planning lessons with a little bit of fun. So knitting takes a back seat. I’ve definitely been in that spot! In the past I’ve done what you said, which was to just pick one up with the intention to finish it. Then when I do, it feels so good to be done, it’s easier to head to the next one to finish! 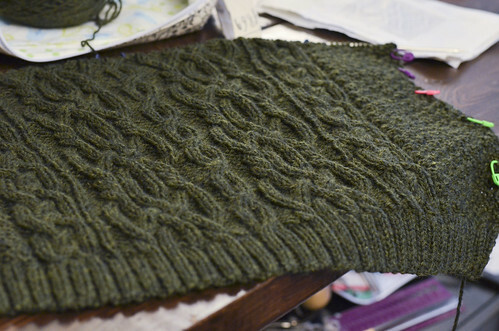 So good to hear, plus I enjoy the how-many-on-the needles; misery (and inspiration!) loves company! I feel the same way in January I decided to knit a sweater every month I managed to get two sweaters knitted for January and February then I started this heavy Celtic cable jacket. as soon as the weather grew nice the less enthusiastic I have become over knitting this jacket.